Ron joins Daniela and her band for a monthly residency of her jazz explorations of Italian songs. 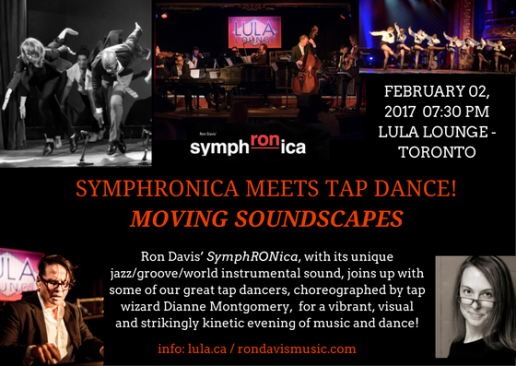 Ron Davis’ SymphRONica, with its unique jazz/groove/world instrumental sound, joins up with some of our great tap dancers, choreographed by brilliant choreographer and tap wizard Dianne Montgomery, for a uniquely vibrant, visual and strikingly kinetic evening of music and dance. Buy tickets online: https://www.bemusednetwork.com/events/detail/300 or call 416-588-0307.